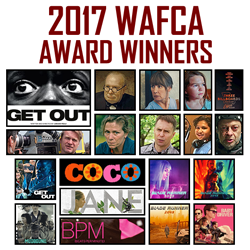 Washington, D.C.  "Get Out" scared away the competition when The Washington, D.C. Area Film Critics Association (WAFCA) announced their top honorees for 2017 this morning. A smart, hair-raising satire about prejudice and race relations, "Get Out" won Best Film, as well as Best Original Screenplay for writer-director Jordan Peele's provocative script. Christopher Nolan claimed Best Director for his remarkably mounted, ceaselessly intense World War II thriller "Dunkirk." WAFCA awarded Best Actor to Gary Oldman for his startlingly transformative portrayal of Winston Churchill in compelling historical drama "Darkest Hour." The film, set during Churchill's first term as Prime Minister in the critical early days of WWII, is carried by an unrecognizable Oldman's assured, multilayered performance. For her searing turn as a grieving, unapologetically outspoken mother desperate for the local authorities to catch her daughter's killer, Frances McDormand nabbed the Best Actress award for the darkly comedic drama "Three Billboards Outside Ebbing, Missouri." The film, directed by Martin McDonagh, was feted with two other acting honors. As a lonely, antagonistic police officer with far more dimension than initially meets the eye, Sam Rockwell was awarded Best Supporting Actor. The Best Acting Ensemble award also went to "Three Billboards Outside Ebbing, Missouri," co-starring Woody Harrelson, John Hawkes, Lucas Hedges, Abbie Cornish, Peter Dinklage, Caleb Landry Jones and Samara Weaving. Best Supporting Actress was awarded to Laurie Metcalf, as a working-class mother struggling to see eye-to-eye with her headstrong teenage daughter, in truthful coming-of-age film "Lady Bird." For their thoughtful adaptation of author Hillary Jordan's acclaimed 2008 novel about the relationship between two familiesone black, one whiteliving in the 1940s Jim Crow South, Dee Rees and Virgil Williams earned Best Adapted Screenplay accolades for "Mudbound." Pixar's touching family adventure "Coco," set during Mexico's annual Day of the Dead celebration, was awarded Best Animated Feature. The film's star, 13-year-old Anthony Gonzalez, earned Best Voice Performance. For his intense turn as leader of the apes Caesar in "War for the Planet of the Apes," Andy Serkis claimed the award for Best Motion Capture Performance. Brooklynn Prince clenched the Best Youth Performance category for "The Florida Project." Best Documentary kudos went to "Jane," a fascinating look at Jane Goodall's 1960s chimpanzee research in Tanzania. The film combines present-day interview segments with Goodall, now in her eighties, and never-before-seen 16mm footage of her experiences in Africa when she was in her twenties. "BPM (Beats Per Minute)," Robin Campillo's touching story of the HIV/AIDS epidemic in 1990s France, took Best Foreign Language Film honors.